DC motors are the most widely used motors. These motors can be found almost everywhere from small projects to advanced robotics. We previously interfaced DC Motor with many other microcontrollers like Arduino, Raspberry pi and used it in many robotic projects. Today we learn to control DC motor with AVR Microcontroller Atmega16. But before going ahead let’s know more about DC motor. DC Motor is a device which transforms electrical energy into mechanical energy. Specifically, a DC motor uses DC current to convert electrical energy into mechanical energy. The basic principle of motor is the interaction between the magnetic field and current to produce a force within the motor which helps the motor to rotate. So when the electric current is passed through a coil in a magnetic field, a magnetic force is generated which produces a torque resulting in the movement of motor. The direction of the motor is controlled by reversing the current. Also its speed can be varied by varying supplied voltage. Since microcontrollers have PWM pins, so it can be used to control the speed of motor. In this tutorial, DC motor operation will be demonstrated with Atmega16. 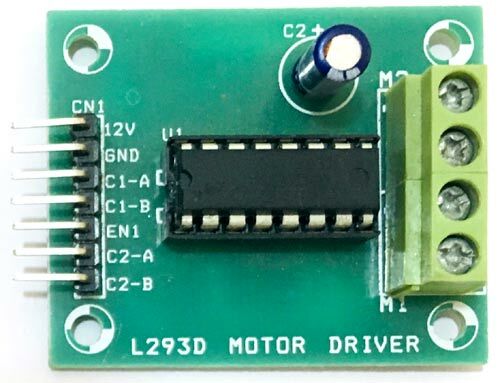 L293D motor driver will be used to reverse the direction of the current thus the direction of movement. The L293D motor driver uses H-Bridge circuit configuration which outputs required current to Motor. Two push buttons are used to select the direction of motor. One of the push button is used to select the clock wise rotation and the other one is used to select the anti-clock operation of DC motor. Here the Atmega16 is programmed using USBASP and Atmel Studio7.0. If you don’t know how to program Atmega16 using USBASP then visit the link. Complete Program is given at the end of the project, just upload the program in Atmega16 and use the two Push Buttons to rotate the DC motor clockwise and Anti-clockwise. 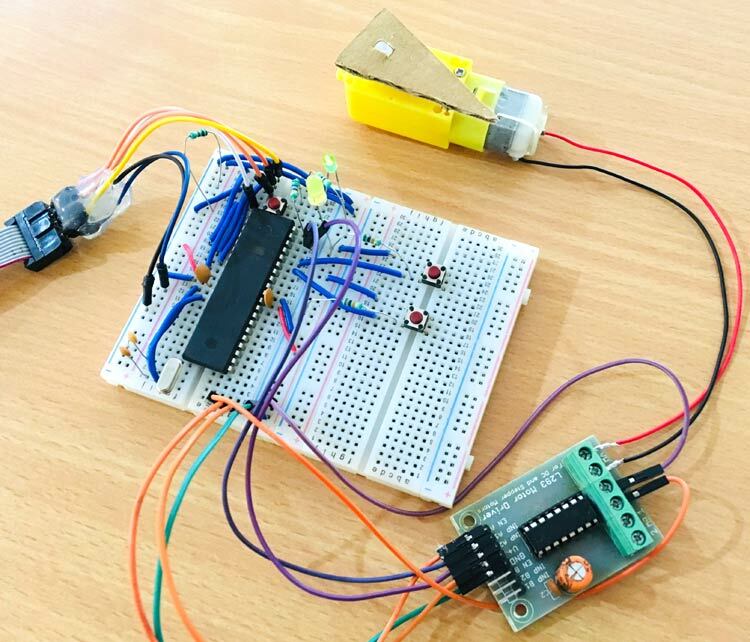 The DC motor is interfaced using L293D motor driver. DC motor will rotate in two directions when respective push button is pressed. The one push button will be used to rotate DC motor in Clock Wise direction and the another push button will be used to rotate DC motor in Counter Clock wise direction. Firstly define CPU frequency of microcontroller and include all necessary libraries. Then, use one variable to keep track of push button pressed status. This variable will be used to define direction of motor. Select input/output mode of GPIO using data direction register. Initially, make output of Motor pin as low to avoid starting up of motor without pressing push button. Check if 1st push button is pressed connected to PORTA4 of Atmega16 and store the status of push button in variable. Similarly check if 2nd push button is pressed connected to PORTA5 of Atmega16 and store the status of push button in variable. If status of the 1st button is true then rotate DC motor in Clock wise direction and if status of the second push button is true then rotate DC motor in anti-clock wise. You can connect motor pins to any GPIO pin depending upon the GPIO used. Also it is important to use Motor Driver IC to decrease the load on the microcontroller as microcontrollers are not capable of providing required current to run DC motors. For more detail and other projects based on DC motors, please visit given link.